Well, who doesn’t need to read THIS little bon mot every day? 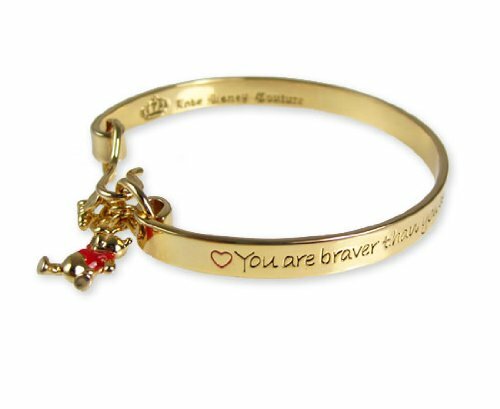 Especially if it’s Pooh who’s telling you: “You are braver than you believe, stronger than you seem, and smarter than you know.” Now, you can be reminded of your awesomeness every single day with this Winnie the Pooh Bangle from Disney Couture. Perfect for you or the loved one in your life who needs to hear about her bravery, her strength, and her smarts as often as possible! Need more items of encouragement for your friends and family? Head on over to the Disney Gift Guides page for a dose of inspiration! ooooooh I am so in love with this. Gosh I wish that I liked wearing things around my wrist, I would wear this all the time.